Finding the right color for a room is crucial. I am so particular about this, and each room is very different, and what each of us wants personally from that color is different too. So I don’t have to tell you how excited I was to meet color guru, Eve Ashcraft, over a year ago at Hammertown. 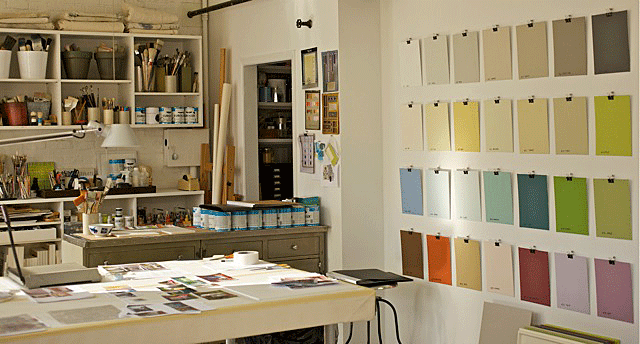 Eve is a master colorist, developing color plans for private clients, architects, corporations, and when Martha called, yes that Martha, Eve picked up the phone and proceeded to develop the Araucana Colors and Everday Colors of Martha Stewart Living line of paints. – Paulette Pascarella. We’re planning on hosting a book-signing event at Hammertown for Eve as soon as her book is officially released — how exciting is that! We’ll keep you posted! In the meantime, enjoy this article Eve sent me from the well-known design website, Dialog with Paulette Pascarella. In talking to Eve I learned she has to immerse herself in the home she is working on, and get to know more about it and the people living in it. That, she says, is how good choices are made and I couldn’t agree more. In doing our new kitchen at Hammertown, I consulted for color with stylist, Wanda Furman. She knows me so well, and she had spent time over the years getting to know the Main House and understanding how color would work in that room. I didn’t want a color too light and yet wanted it to still be light with a feeling of warmth. We tested a lot of colors…some so beautiful in other houses I had seen but they ended up being totally wrong for the space. I am sure this is the process Eve would have done, if she had been here. Wanda just kept telling me to put samples up on the wall and explore and then Gregg, Brooke and I would discuss. Gregg and Brooke wanted light…I wanted light and warmth…not too cold. Eventually we came up with a color that pleased me, it seemed light enough for them (although they feared too dull), but I promised them once the rest of the room came together, there would be other important pops of color. I also didn’t want the cabinets and the island colors take away from the other interesting pieces and elements coming into the room. I have been thinking lately about having a design day once a month on Saturdays where I invite Wanda (and other designers) to come and meet our customers who have design questions…sort of a Q & A session at Hammertown. Customers would also bring pictures of their homes to help in explaining their questions. So…here’s your chance to let us know if that would be something you, our readers and customers, would be interested in. We’d love to start this Fall…which is the perfect time to think about redecorating! Just email me at joan@hammertown.com and let me know. I think it would be a lot of fun and we’d all learn a lot! THANKS so much for the fabulous write-up. I LOVE Hammertown and the team of like-minded souls that make it the brilliant rural oasis that it is. I hope patience is in big supply since, unfortunately, my book is due out in one whole year! not this fall. The paint will be available this coming summer. I will keep you posted. Thanks again for the wonderful post! We love you too! I remember first meeting a few years ago when you complimented me on the color we painted the barn. I was so appreciative and told you that you were the first person that even noticed it had been painted and commented on it. I loved it, but didn’t know how other customers felt….for months nobody said anything. And, then when I found out how you made your living, I was totally thrilled. The master of paint loves the barn color! And, that’s how our friendship began…we bonded over paint, and have been good friends ever since…paint or no paint.